Just copy and paste this code and you’ll be good to go. Collect your articles from your favourite blogging platform (we recommend WordPress), add an introduction and a little bit of information about yourself for credibility. Be sure to put all crucial points into individual slides but don’t overwhelm people by including every line or sentence from your article. That defeats the purpose of the medium. Slideshare is a great platform for content discovery so be sure to include a keyword rich title and description to help users find it! Start by tweeting the key points from the post, then follow up by asking a question about it. If you have included any quotes in your post be sure to turn them into tweets and @ mention the source for some extra promotion. And last but not least, don’t forget to include a link back to the original post! This one is more simple than it sounds. Record yourself discussing the post and go into more detail about any examples that you mentioned. Be sure to offer practical advice as people are more trusting when they can see your face! You can record yourself using your computer’s built in camera and microphone. There are a few different ways to do this. Firstly, you can simply record yourself. Alternatively you can use text to speech software. And if you have a slightly bigger budget you can hire a professional from a freelance site like Elance. Once you have the audio recorded, you can submit it to iTunes, Podomatic, Podbean or any other service. 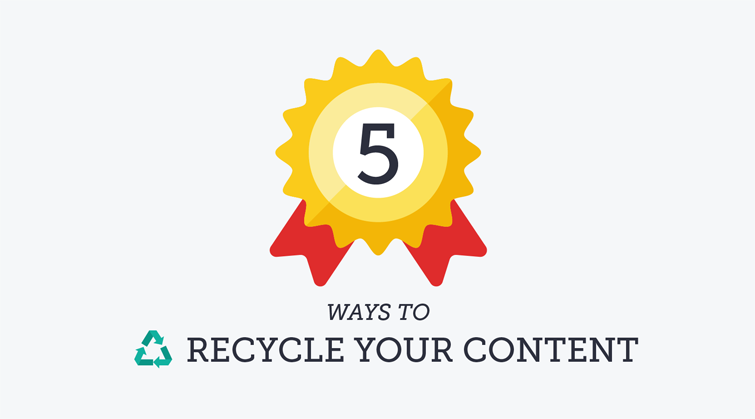 Repurposing content allows you to serve different audiences, attract buyers at different stages of the buying cycle and most importantly expand your reach! Have you tried recycling content yet? Tell us about what worked and what didn’t in the comments below! This entry was posted in Content Marketing, Lead Generation, Productivity and tagged ebooks, lead magnets. Bookmark the permalink.